I picked up a pint of blueberry muffins at the Farmer’s Market last week; last night I turned them into the most delicious blueberry muffins. 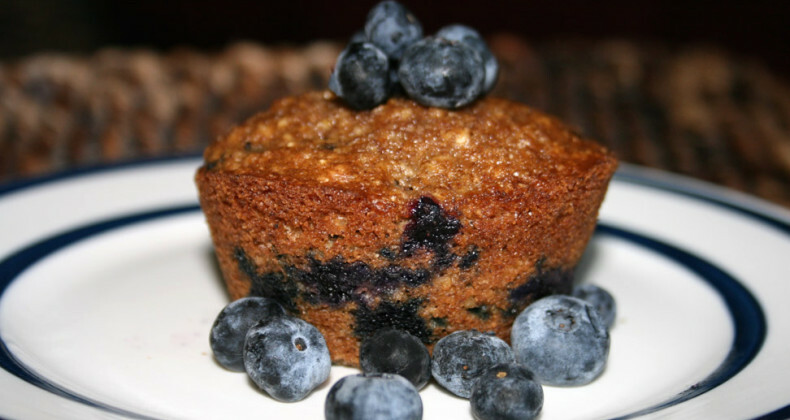 These are the best blueberry muffins I’ve ever had; and as a bonus they are low in calories! Truly a delicious breakfast (or snack) without the guilt. Each muffin contains 169 calories, so don’t feel bad about reaching for seconds. I found the original recipe on Cooking Light’s website, but due to the availability of ingredients in the pantry I needed to adapt it to fit my needs. Below is my adaptation. ENJOY! If using frozen berries, toss with 2 T flour to coat. Place oats in a food processor; pulse until oats resemble coarse meal. Place in a large bowl, add flours and next 5 ingredients (through salt) to oats in bowl; stir well with a whisk. Make a well in center of mixture. Combine sour cream and skim milk, stir to thin out sour cream. Add oil add eggs; stir well with a whisk. Add to flour mixture, stirring just until moist. Stir in lemon juice. Gently fold in blueberries until just combined. Spoon batter into 16 muffin cups coated with cooking spray; sprinkle batter with 2 tablespoons granulated sugar. Bake at 400Â° for 18-20 minutes or until muffins spring back when touched lightly in center. Remove from pans immediately. Place on a wire rack. Serve warm or at room temperature.